Well... it has certainly not been boring since rounding Cape Horn on Thursday! With 40-50 knots of wind on the beam, King Neptune only reluctantly released GS2 and crew from the Southern Ocean on Thursday, as we scrapped our way around The Horn and pointed the bow north. I was originally thinking we would leave Staten Island to port, and likely the Falkland Islands to port as well, but the wind angle was better to head for the Straits of LeMaire, which is the passage between Islas de los Estados (Staten Island) and the mainland. Many people had told me that the Straits were a dangerous place- with very strong currents and fickle winds- that had caused many sailors trouble in the past, but I emailed with Ken Campbell at Commanders Weather and he was able to obtain good local tidal information that indicated we could get through. I was about 130 miles away so had to time my arrival at the southern entrance for 5:00 AM UTC, so I had to slow the boat down by taking down the jib and reefing the main. I slowed to about 7 knots from 9 knots and ended up timing it well and got there just as the flood tide was turning north. It was pitch black in the wee hours of the morning as I quietly slipped through, with no other traffic and no lights, but I did see land on my radar, as I was only about 6 miles from the mainland coast. The channel was about 20 miles long, and the tidal flow increased as I went along until at the end, I had 4 knots of current with me! A magic carpet ride in complete darkness! I was very thankful we had the tidal information correct, as I think it would have been very ugly to have wind against tide in the narrow passage. So we shot clear of Staten Island and continued north towards the Falkland Islands, aiming to leave them to starboard, as that was the shortest route north. I had pulled an "all-nighter" to get us to and through the Straits, which was quite stressful, so I collapsed into the bunk for some rest. 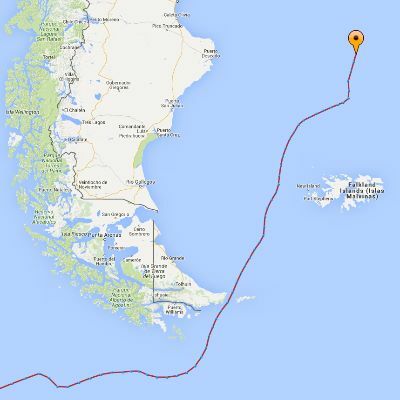 I really wanted to be sure and clear the Falklands, as it has also been a stopping point for some previous racers, and the Westerly wind made it a lee shore to the east. However, I was able to sail past without incident, although as I cleared the northern tip of the island at night, I came across a large number of fishing vessels, all very brightly lit up from stem to stern... very puzzling. I happened to be emailing with Rich Wilson, who had sailed through here before, and he informed me that they were fishing for squid- who are attracted to the light. As I sailed on I was amazed at the size of this fleet- easily 30 pretty large vessels- spread out along a shelf- where the water shallows before the island. So my challenge became weaving through all these boats at night with yet another gale with Northerly winds approaching. Yup- another all-nighter, with a few close calls with both squid boats and two cargo ships- a very busy place that I had no idea about! So I am now clear of that hazard- the northerly gale blew itself out last night and I have a kite up in a SouthWesterly breeze with a beautiful sunset and warming temps. Ahhhhh, to be in the Atlantic again. I wasn't sure I was going to escape the Southern ocean alive... so it feels very good to be off the coast of Argentina heading north. So after a nap and some food and a few celebratory sips of vino, I am feeling pretty good to be on the home stretch of this voyage and back within reasonable range of assistance should something happen. I think the sailing conditions along this South American coast will be very different from the heavy-air/ downwind conditions of the Southern Ocean. I am now sailing towards an area of high pressure, so the next three days look to be light airs, which I hope will give me an opportunity to repair my damaged Solent jib and test the auto-pilot ram that failed during that Southern Ocean gale a few weeks back (involuntary shudder). So I think this will be a different kind of challenge- with a fair amount of upwind sailing- and the long range target being Recife, Brazil (8' South X 32' 50 West,) a bit less than 3,000 miles to the NorthEast, at the "Bulge of Brazil" (remember the Bulge from the way down? ), where I will cross my outbound path. That is the turning point for Newport. So many miles to go, but it’s exciting to be around the corner and in much warmer and more hospitable conditions!